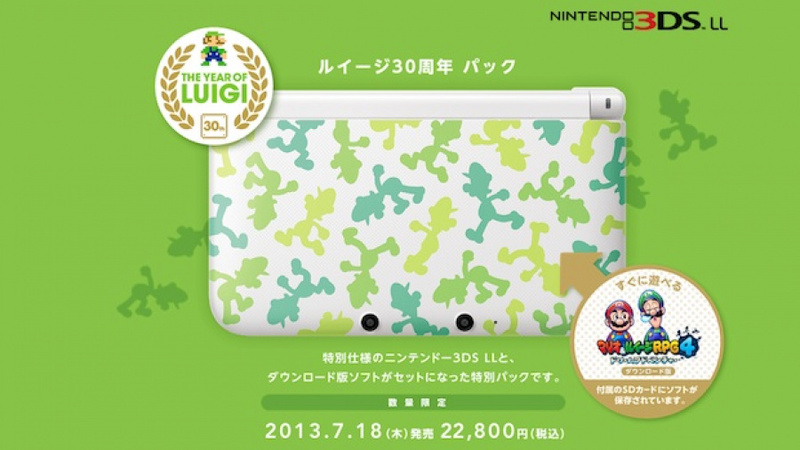 Back during the April Nintendo Direct, the Japanese broadcast showed off the new Luigi 3DS XL model, and it wasn't revealed for other territories. Considering it's a special edition to tie-in with the release of Mario and Luigi: Dream Team, we're running out of time for confirmation that it's coming to the West — E3, if we're lucky? In any case, details have now emerged for the new XL. As expected it'll arrive in Japan on 18th July, and it'll include a digital copy of the game pre-installed on the system's 4GB SD card. It'll cost 22,800 Yen, which is more than a standard XL in the region by roughly $20-25, meaning that those that opt for the hardware are ultimately getting the game for slightly less than normal. We do have the Animal Crossing: New Leaf 3DS XL bundle on the way, however, so it's not all bad. We do rather like this Luigi design, so let us know whether you want it to come Westward in the comments below. I would love to pick up this 3DS XL. My blue XL is looking a bit sorry as some of the blue paint has rubbed off and there are scratches on the hinge. Man, Looks pretty cool. And agreed, my blue 3DS XL is looking pretty rough too. Love it though, pretty tough system, the places I take it and handle it, I would never do with a psp-anything. On the back. I believe there's a hidden Mario silhouette on it. I like it more than the batch we have in NA, but still feel Nintendo is gipping us of quality colors. Who wouldn't buy a true NES, SNES, or N64 themed XL? What about that neon pink one (it's not XL) that Japan has --it's a manly pink? So would I buy it, sure ... but I dream of more. I just hope Australia gets something, anything. I'll buy this or the Animal Crossing XL one, heck even the Fire Emblem XL. It's so hard to import a console because a small defect will take weeks to exchange. Hopefully it'll look better in person like the AC XL. I love the design! Too bad I can't afford it... I can't even afford to get games for my Wii U. Kind of looks like someone puked up their greens on their 3DS. I'd be all over this or the Animal Crossing model if either had a more interesting design. A plain green cover with a small while silhouette of Luigi would have been better, IMO. This looks hideous. It looks like the worst camo design ever more than a lugi design. Keep this thing away from the rest of the world. They better release this in EU! I'll pick it up in an instant! I don't get why they just don't do solid colors with a decal or something. Those tend to look the best in my opinion. Another awful design choice for special edition XL's. Way to keep the trend alive, Nintendo!!! Not a fan of this color to be completely honest. Much rather have a purple XL or a Project X Zone styled XL. EDIT-Wait, I'd much rather have a Waluigi 3DSXL! This is a really nice looking 3DS xl! I'd get it if it came out in the US before the Animal Crossing NL one... but I already have it preordered. I'd trade/sell my blue XL for this beauty if would come stateside. Looks like a Marimekko print from the 60's. yeah this is pretty awful, imo.